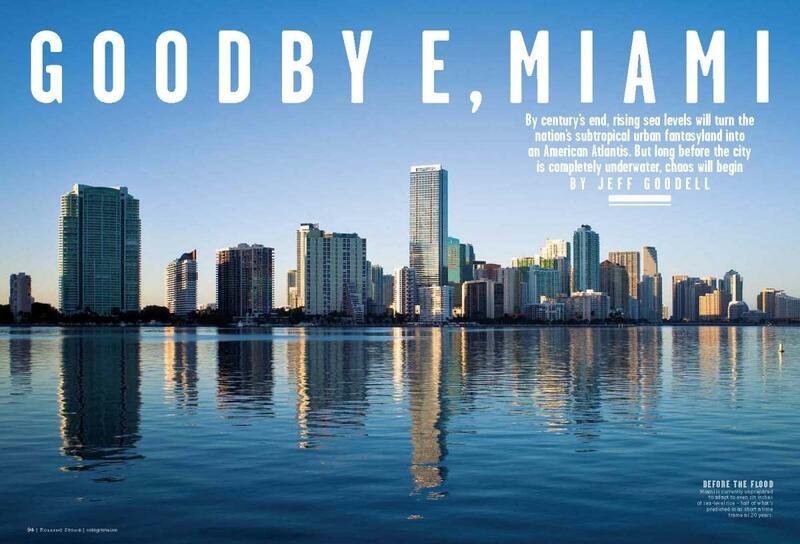 Rolling Stone's article imagined a future where sea level rise forces Miami to become abandoned. Let me say, first of all, that Rolling Stone has successfully brought this problem to the attention of a much larger slice of the public than has previously been the case, and this is a good thing. The article paints a devastating picture of the future of Miami associated with a number of expected impacts due to sea level rise as a consequence of unabated global warming and extensive ice sheet melting, primarily in Greenland and Antarctica. I have no argument with the expected south Florida impacts outlined in the article: gradual inundation of low-lying coastal areas, eventual exacerbation of future storm surge damage by rising mean sea level, contamination of the aquifer from which we pump our drinking water, and more storm flooding due to an increasingly compromised drainage system. The article also delivers well-deserved criticism of our politicians and their lack of leadership, especially at the state level, and of the lack of transparent oversight of large public works projects such as the refurbishment of our water treatment system and the construction of two new nuclear power plants that will possibly become an island within this century. My problem with the Rolling Stone article is its depiction of too much, too soon and the lack of any sign of hopefulness as to things that can be done to mitigate or adapt to the expected impacts. The article paints us as a bunch of hedonists who deserve our lot and may as well pack our suitcases and head to Colorado like Noah’s Ark to Mount Ararat. Why bother to write our elected representatives to demand action, or elevate our concern as voters to the level of other issues such as the economy? Why join in community efforts to adapt and mitigate? The article emphasizes the extremes of what could happen without pointing out how unlikely they are to happen or to happen as quickly as suggested. The article starts with a fictional account of a maximum intensity hurricane coming ashore in 2030 with a 24-foot storm surge on top of mean sea levels that will have risen by a foot in only 17 years and will continue rising by a foot or more per decade. For starters, storm surges of 24 feet are quite unlikely in southeast Florida because of the abrupt rise in the sea floor as storms approach the coast. But certainly 18-20 feet could be expected in extreme cases. The consensus scientific projection of future sea level rise by 2030 is for somewhere between 2-3 inches and 9 inches, with the most probable being about 6 inches. And finally, rates of sea level rise will only reach a foot per decade sometime in the 22nd century, depending on how quickly the world mitigates the release of greenhouse gases. The article goes on to cite one scientist’s projection of up 16 feet of sea level rise by 2100, far above the already unlikely amount of six feet that can be expected based on the vast majority of credible climate research to date. Far from being blissfully unconcerned, south Florida is one of several regions nationwide, including San Francisco and New York, cited for their community leadership in regard to sea level rise and the exploration of measures that can be taken. Scientists and municipal administrators in the four most populous counties of Florida have agreed on a consensus projection of future sea level rise based on the best climate research currently available, and an Action Plan has been developed for a coordinated array of policy objectives to pursue over several time scales. Soon this will be expanded to encompass seven Florida counties. To complement all this, we now have a Miami-based CLEO Institute, which has a mission to form a cadre of climate change communicators to advance environmental literacy and civic engagement on climate change issues in a chain-letter fashion. South Florida municipalities have a wide panoply of available adaptation policies that range from removing insurance subsidies that encourage coastal development in vulnerable areas to innovative ways to maintain our fresh water supply, and much more. But are we as individuals powerless to take action, as Rolling Stone insinuates? Far from it. At a personal level the average middle class citizen can do his or her part by walking the walk and talking the talk. In a far less sunny place than Florida — Germany — houses with solar panels dot the landscape, proving that solar energy is getting less expensive and more ubiquitous every year. Like buying LED lighting for your house, solar panels pay for themselves over time and can be financed in ways similar to the way we finance our houses and cars. An ever increasing number of cars are appearing on the market that save gasoline in the range of 100 miles per gallon and pay for their extra cost in five years or less. President Obama has taken the lead in carrying this idea to the level at which we produce power, creating entire new industries that will create jobs, make America more competitive and independent and reduce the costs of health hazards created by coal burning. Finally, we have the power to vote out of office our politicians who refuse to recognize and act on what virtually every climate scientist has been saying, and in doing so to secure a better future for our grandchildren. Adaptation strategies can be implemented at a relatively modest pace that matches the gradual encroachment of climate changes. But we are running out of time to reduce our output of greenhouse gases so that the worst scenarios depicted by Rolling Stone do not become a reality. David Enfield graduated in physics and geophysics from the University of California (Berkeley) in 1965. He obtained M.S. and Ph.D. degrees in Physical Oceanography at Oregon State University in 1970 and 1973. He worked as a NOAA oceanographer until he retired from government service in 2008. He now continues to do climate research at the Cooperative Institute for Marine and Atmospheric Studies at the University of Miami's Rosentiel School of Marine and Atmospheric Science. His research interests include El Niño-Southern Oscillation, Atlantic Ocean variability, and their interactions with western hemisphere climate fluctuations.